Hey guys where do you buy your serge panels from? I've been looking online but can only find that serge-fans website with no links. Can you guys hook it up? You have to call Rex. The number is on the Serge Fans Site but here it is again. We need to sticky a thread with this info, it gets asked A LOT around here. didn't mean to make a sticky dude... muff... a little help? Damn, I live in madison, Wi. I know wiard is (or was?) based out of the milwaukee area but serge too? Are they related at all? don't worry! i made it a sticky. good to have the information in an obvious place as it does get asked fairly frequently. Does anyone know the reasoning behind having no real web presence for STS? Not saying it's a bad thng, just that it's a bit unusual when compared to every other manufacturer. Because serge didn't need adverts for the past 30 years. To a degree I agree with you however having a website could only benefit STS. Either way... there is a certain intimacy a serge owner must feel with the company due to this form of minimal advertising. It is neat that he has survived solely on reputation and word of mouth alone. I think generally speaking Serge-Fans.com sits in the role of a semi-official website, and Carbon111's website fills in the gaps as a Serge user. The only thing that would be nice is to know the current prices without having to make a call Ã¢â‚¬â€œ for me I'd rather call when I'm ready to make a purchase, not a year in advance! How about Serge repairs? Does anyone have recommendations for people who have some experience getting Serge systems back into good condition? 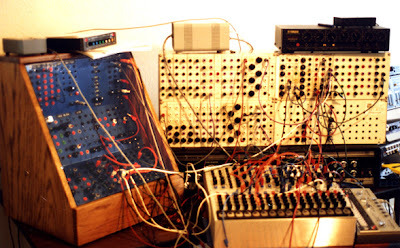 CalArts has a Serge modular synth (pictured below) that's in need of some repairs. I think it might just be a case of replacing some pots and some jacks, but with a system like this, I might want to relegate that task to someone with a good bit of familiarity with working with and repairing Serge systems. Any infor at all would be appreciated! Woah how come I've never seen a pic of this system before? This almost makes me want to do my DIY panels in black. How about Serge repairs? Does anyone have recommendations for people who have some experience getting Serge systems back into good condition? I think you might consider Kevin Fortune. He used to work with Rex in Oakland, and flies out to help him when he gets really swamped. I don't know his contact info, but give Rex a call. I'm pretty sure he still lives in the SF Bay Area. Here's more information. I thought it was only on Darrel Johansen's long gone page but it happens to be right here. Don't forget the Blue Serge, too! Cool read, thanks Cebec! I've seen the blue one before, but never this black one! man it's not easy to search on here is it! Rex has promised to get with me shortly to provide the most current pricing on Shop Panels and some other stuff for www.serge-fans.com. Will let you folks know when things have been updated. Howdy, and welcome on your first post. I do not think your prices are really that off from what I remember. Although the S-case and M-case are not represented yet. Such an informative site however, I am always staring at it trying to plan my next purchase.